LOVE this, dear friend, especially this part: “The source of all needs is Jesus and clinging to the fringe of His garment.” What a wonderful visual and something I’ll always remember. That is beautiful and so encouraging, Lynn! Thank you for sharing this important information and inspiration. Hi Lynn! This is my most favorite passage in Scripture. What woman can’t connect with a fellow woman in this problem? And I’m sure the ‘medical treatment’ back then was barbaric. Just touching the Lord, but in a meaningful way, on his fringe, send the healing she desires. How powerful everything about Jesus is! Thank you for the information on the making of the prayer garment. I didn’t know about that. This is one of my favorite passages and you made it come alive for me today. Thanks for some additional background to this story of love and healing. Hope you are having a terrific week. This is a wonderful post, Lynn! What a lovely reminder that the solution to our concerns–be they health, financial or other–come from our good Lord. Wow, Lynn, you really dug into this scripture and I have learned so much from reading this post! I want to press into him and receive all the anointing and healing power he has in my life, so that I may share it with others. Beautiful post. Thank you for sharing and joining us at #RaRaLinkup. I never knew this about the tallit — what a fascinating connection! This Bible story is of special significance for my husband and me, as we portrayed it in dance. Linked up behind you at Cheerleaders of Faith. I love this. To be healed we cannot just be in the crowd but we have to actively pursue him and reach out for him. We have to do our part too. It is so easy to not make the effort this woman did. Shanda, thank you so much for visiting and commenting. So happy to see you. Bless you! Grabbing hold of His hem in some very needful areas! 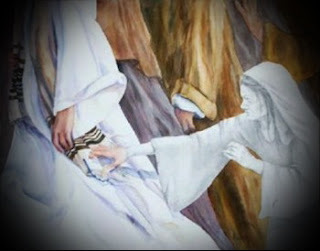 Thank you for such a powerful reminder of the power of just touching the hem of His garment! Love you, friend! VERY interesting, Lynn. I love the thought: Cling to the fringe. That might just have to go up on my fridge today. Beautiful post, Lynn! The touch of Jesus gives us all we need! This post touched my heart in several ways Lynn. As I was going through menopause I haemorrhaged for 6 months one Summer. I was extremely weak, pale and anaemic, eventually ending up in the Hospital for blood transfusions. I remember saying to a friend how much I identified with the woman in the Bible who touched the hem of His garment, with the utter desperation she felt. Yet God answered that desperation and met that deepest need because He saw her heart, faith and courage. Thank you for illuminating this text so beautifully. Oh, yes, Stephie! I agree. Grabbing hold and not letting go! Thank you, sweetie! Tracy, I’m so sorry. Saying a prayer for you, sweetie. Blessings to you! LOL Thanks so much, Carol! You’re a peach! Bless you! Thank you, sweet Lisa! I so appreciate you! Bless you! Oh, Elizabeth! I am so sorry you had to suffer all that. Yes, you have a scripture-sister with this woman, didn’t you? I pray you have much improved. Thank you so much for your comment. You’ve blessed me. Bless you! Thank you for reminding me of this powerful healing moment. Jesus made himself so accessible and he still does. I so love this, I did a short devotional article using the woman’s faith as the basis. She needed love and acceptance, as she would have been considered “unclean”. through her faith she was healed. What a beautiful post. I love the picture you painted for us with so much detail! I’m visiting via SDG and noticed that you have fibromyalgia. I do, too. I find it very interesting how many bloggers have fibromyalgia. I thank God for the gifts of writing and chronic pain. I think they go well together. If I did not have writing as a creative outlet, I don’t know what else I could do. Without pain, I think my writing would lack. God bless you, I am happy to have found you today! Beautiful message, Lynn! I love how you said, “Others in the crowd pressed into Jesus’ presence with their flesh, but this woman pressed into His presence with her faith.” Awesome! I’m doing a series on healing on my blog starting Monday. I would love to share your link to this post if you don’t mind? It goes perfect with the message God has put on my heart. So true, Dea, and so glad He does! So happy to have you visit. Thanks so much for your comment. Blessings to you! Hey, Mel! So happy to see you here. Isn’t it awesome that He takes us just as we are? Thanks so much for stopping by and leaving a comment. I deeply appreciate it. Bless you! Wonderful post Lynn. I love all the details and colorful word pictures. I own a tallit (prayer shawl) made in Jerusalem. It’s simply stunning! Mine has red, blue and gold threads running through it. It is also embellished with a gold crown and blue & gold ribbons in the fabric. The knotted tassels are cream colored. It is precious to me and I have often worn it during prayer time. I also have a print of Jesus in His tallit. Thanks for this reminder of how faith triumphs over failure. I love history lessons like this, that deepen the understanding. 39 tassels? 39 lashings! What a connection!!! I’ve decided that I cannot have a favorite healing story – each story I read – it is my favorite – each testimony of His great love. One of my favorite parts is her outspokenness in her actions! I like that, too! You blessed me today! I want to be in a place of such great faith. The question for me is — what would happen if I don’t reach out and touch His hem? That has huge ramifications in my life. Deborah, I love tallits! I have one but don’t like it. I’m going to send hubs to the Jewish shop to get a good one. Thanks so much, sweetie. Bless you! ML, isn’t that awesome about the 39 windings? I love that! Thanks so much, sweetie, for your comment! Bless you! Jen, I am so honored to have you visit. And I agree…what happens if I don’t reach out? Thank you so much for the visit and comment. I’m honored. Blessings to you! Thanks so much, Ceci, for commenting. You make my heart so happy! Bless you!